(Bloomberg) -- Well, that didn’t take long. 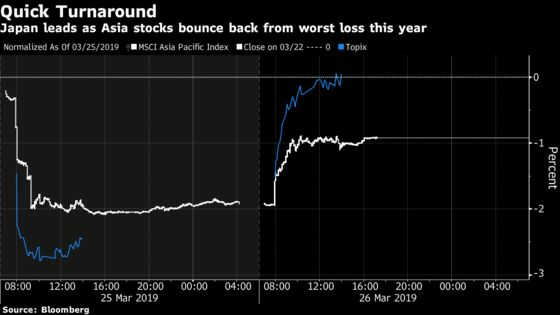 Markets across Asia bounced back Tuesday from their worst drop of the year as the benchmark MSCI Asia Pacific Index rebounded 1 percent. Japan led the way, with the Topix index recovering all of its Monday loss. India, Taiwan and South Korea stocks also edged higher to round out gains across the region, with the big exception being China: the Shanghai Composite Index completed its worst two-day slump in more than two weeks. U.S. equity-index futures advanced 0.3 percent. The quick turnaround for Asia comes just after the S&P 500 Index and Euro Stoxx 50 Index ended largely flat on Monday following their Friday rout on the back of renewed global-growth concerns. Investors are debating the deeper meaning behind the first U.S. yield curve inversion since 2007, commonly seen as an indicator of a looming recession, and bond yields elsewhere hitting fresh lows. In Japan, where more than 1,500 Topix companies go ex-dividend on Wednesday -- meaning it’s the last day to scoop up stocks and receive the next payout -- investors bought shares including Sony Corp. and Takeda Pharmaceutical Co. to gain dividend rights. Nintendo Co. was also a big contributor to the index’s advance, boosted by a Wall Street Journal report that the company will introduce two new Switch console models as early as this summer. Meanwhile, South Korea’s Kospi index edged higher, taking a rare profit warning from Samsung Electronics Co. in stride. The stock slipped just 0.6 percent after the tech giant said first-quarter results will miss expectations as prices for memory chips and displays fell. Of course, a one-day rally doesn’t mean markets are out of the woods yet, said Nader Naeimi, head of dynamic markets at AMP Capital Investors Ltd. While investors are back in the markets, they will be looking for a rebound in economic indicators over the next month or two to see if the shift in central-bank policies is having any effect, said Tai Hui, chief market strategist at JPMorgan Asset Management, in an interview with Bloomberg Television. Earnings growth is another factor, with the bar “pretty low” at the moment, Hui said. 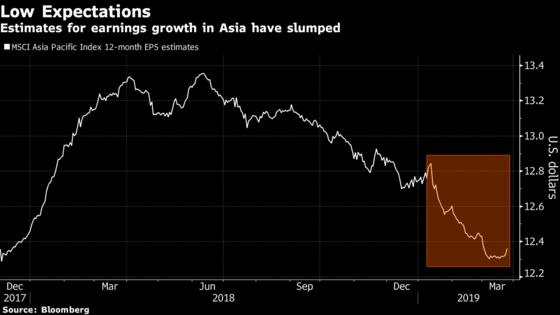 Analyst estimates compiled by Bloomberg show profit projections for MSCI Asia Pacific Index companies have fallen more than 7 percent in less than a year to about $12.40 a share, back to levels from the end of 2017. “After that correction we saw yesterday, investors are coming back in to some extent, tiptoeing back into markets with caution,” Hui said.